Truly, ever since it became clear that The Avengers was happening, fans had a lot of hope that Spider-Man would be a part of that world, and with the release of Captain America: Civil War, they finally got their wish. Tom Holland has delivered what very well may be the best on screen Spider-Man we have ever seen and he will be getting a big chance to really shine next year when Spider-Man: Homecoming is released and as the film nears production, we have been slowly learning details about the villains and loose plot details. 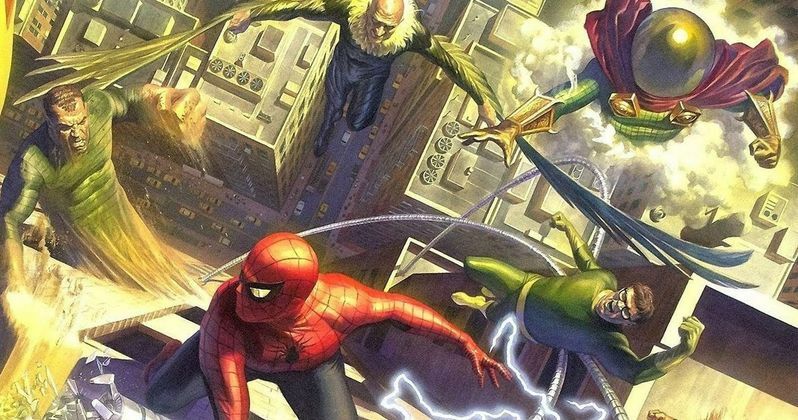 Though it is very early on, it looks like Marvel Studios may be laying the seeds for something much bigger to come with Spidey's arc in the Marvel Cinematic Universe, and that thing could be The Sinister Six. For those that may not be as familiar with their Spider-Man history, The Sinister Six is essentially an Avengers style band of supervillains who team together to try and take down Spidey. The group first appeared in The Amazing Spider-Man Annual #1 in 1964 and the group was headlined by Doctor Octopus. Over The years, Doc Oc has been a main fixture of the group, but it has had a huge rotating cast of members and has made for some of the most compelling and challenging stories for Spider-Man in his long storied history as a character. So, it would be pretty cool if Kevin Feige and Co. were planning to bring the supervillain supergroup to life on the big screen, and there is already evidence to support that they might be. Granted, this will be largely speculative, so be warned this should all be taken with a relative grain of salt. Recently, it came to light that Michael Keaton has come back around and is once again in talks and possibly has already inked a deal to play the main villain in Spider-Man: Homecoming. As for who he is playing? That hasn't been announced yet, but it is highly rumored and seemingly logical that he will be playing Adrian Toomes, aka The Vulture. Toomes is one of Spidey's earliest and most enduring villains and happens to also be one of the original members of the Sinister Six. It is likely that if Marvel can actually pin Keaton down for the role they will have him signed on for more than one picture, so assuming he is featured in Homecoming and isn't killed, he could easily be around for another film with some of his other bad guy pals. Another rumor that was floating around this week was that Kingpin from the Netflix Daredevil series was potentially going to be included in Spider-Man: Homecoming. Vincent D'Onofrio took to Twitter to clarify that he hasn't heard anything official about it, but he would be very open to the idea. Though Wilson Fisk was never an official member of the Sinister Six in the comics, the 90's Spider-Man The Animated Series featured Fisk as the primary villain for the duration of the series and he organized the Sinister Six within the show, so there is precedent for him being involved. If he were to cameo in Homecoming and interact with Toomes to some degree, the initial seeds could be planted to grow the Sinister Six over the course of a couple of films. Prior to the revelation that Vulture would be the likely villain featured in Spider-Man: Homecoming, there were very persistent rumors that Kraven the Hunter, another classic Spidey villain who also happens to be one of the original members of the Sinister Six was going to be the main bad guy in the first MCU Spider-Man film. The plot would have likely followed, at least loosely, the Kraven's Last Hunt storyline from the comics, which is considered one of the best storylines in the character's history by many fans and critics. The story would likely make more sense for a second film in the series, as Kraven is a big game hunter who is at one point contracted to kill Spider-Man by his half brother Chameleon (another member of the later incarnations of the Sinister Six), who then becomes obsessed with killing him as he is viewed as the ultimate big game prey in Kraven's eyes. So even though Kraven likely isn't going to be the villain in Homecoming, at least in a major capacity, the character and storyline are clearly on the studios radar and is very likely ground that will be covered during the Holland era of Spider-Man. Assuming that even something vaguely resembling this two movie outline comes to pass, that would set up at least three and maybe four members of the Sinister Six, that could easily lead to a third film where the other members are realized and the team is complete. As far as who those other members would be? There are quite a few options. The first and maybe most obvious possibility is Venom, who may be Parker's most well known and popular villain. However, Sony reportedly has plans of doing a Venom solo movie and the character has also already proved to be a bit too much to tackle in a big team movie when Sam Raimi included him in Spider-Man 3. Another option would be Mysterio, who was a rumored possibility for what would have been the fourth Raimi Spider-Man movie as well as a fan favorite. Green Goblin has been done to death at this point, so it is possible that Marvel could go the Hobgoblin route, but that would require some character changes to make it work without Green Goblin having come first. Also, Doctor Octopus is a very vital member of the Sinister Six and there is no doubt that Marvel will want to bring him into the film side of things at some point, as hard as it will be to accept another version of the character give that Alfred Molina's take in Spider-Man 2 is so beloved and was pitch perfect. The point is, there is no shortage of options. As mentioned, this is all very speculative, but it would make total sense for Marvel to play the long game on this one and really up the stakes and give us something we've never seen in this series of Spider-Man films. The Amazing Spider-Man 2 heavily teased a Sinister Six movie that would have followed, but obvious that isn't the way things shook out, but it is an idea that has already been bandied about and is no doubt being considered. Plus, it would be a great way to up the stakes and possibly include some of the other Avengers to give Parker a hand in a very organic way. Only time will tell if this is what Feige is planning, but the prospect is exciting.